As much as I have tried to manage on my own, relying on a very small circle of friends for support, I know the time has come to ask for help from the larger community. The moment that drove this point home was today when I learned I must now vacate my apartment in sixty days. Sharing anything of my personal life and asking for help has always been very difficult, now is no different, so please bear with me. I was fortunate enough to spend my career with only one company, and I fully expected to stay there until retirement. As sometimes happens, that was not to be – but I was confident in making the best of the situation moving forward. Unfortunately, within a year, I was hospitalized for the first time in my life with what initially was diagnosed as a stroke. While I was in hospital recovering, various tests indicated several other medical issues that would require lifelong medical care. From that point on, I never really felt truly well again, but chalked it up to the after effects of the stroke, and being on so many medications for the first time in my life. Regular brain MRI’s were part of the follow-up care, and after the second one it was determined that the lesions in my brain were more indicative of a diagnosis of Multiple Sclerosis, than having had a stroke. Since the diagnosis, I have been hospitalized six times, the most recent to halt the progress of an infection that had spread to my bloodstream (and an interesting trip that was I'll tell you). MS is a degenerative disease of the Central Nervous System, in which your auto immune system attacks the nerve coatings in your brain and spinal cord. It affects the ability of the brain to communicate with the rest of the body. Although everyone’s symptoms differ, they commonly include extreme fatigue, weakness, memory and vision problems, and mobility difficulties. Personally, I experience each of these in varying degrees, with declining mobility the toughest to come to terms with. How this affects my life. I have tried so hard to not let my health challenges stand in the way of staying positive. But, despite all my efforts, I am just not the same person as I was before. Am I going to get better? No – I get that, but am willing to keep the fight up regardless, as they say “it is what it is”. Where the whole thing falls apart is the effect your illness has on maintaining any quality of life. Dealing with one is manageable, but trying to deal with both is almost impossible. If you could find it in your heart to support my GoFundMe by making a donation, and share my story with your network and friends I would greatly appreciate it. I know that money is tight for everyone, so please know that even $5 helps me get closer to my goal. Let me know if you have any questions, and I’ll be happy to answer them. Thank you for reading my story, and for your help. Having been just about sixty days since the move, I figured it was time for an update on the progress of my campaign to get things back on track. Particularly for those who had been kind enough to participate, it is an opportunity to know how much the donations have accomplished so far. At the outset – one of the tools of Go Fund Me is to allow for a personal e-mail thank-you for contributions. It is something I used every time someone offered their help, as I know that every dollar contributed was a dollar less in everyone’s wallet, and that is something to recognize appropriately. I have found that in a lot of cases, these thank-you’s may have ended up in a junk mail folder without being seen. So, although a blanket thank-you to everyone isn’t quite the same, please accept my heartfelt thanks to every single person who has helped. Every single contribution made a difference in beginning to turn things around. If your junk mail folders don’t empty automatically you just may still find my thank-you message. From where we left off previously I was beginning the search for a new place to live, and my biggest hope was to be able to come back to Vancouver. Sadly, that wasn’t going to be the end result, but nonetheless the change that your contributions allowed made every bit as much of a difference. The fact that I ended up moving in an opposite direction to Vancouver was the right decision for the time. I finally nailed down a new apartment on the final day, even though it meant that I was moving to both a new home, and a new town without having seen either. My situation at the time dictated that there weren’t many alternatives to just jumping in the water and hoping I remembered how to swim. Right up till the end I continued to look at places in B.C. & places in Ontario – and in the end, Ontario won simply because it was a bit easier, both mentally and physically. Having had 20+ moves under the belt in my life, this one was by far the most difficult. A combination of the additional stress, and physically having to stop and rest every fifteen minutes made the whole ordeal one I am not anxious to ever repeat. I will not miss the old place. Having been there for nine years, I can’t really even think of any happy memories. It was the time of ending a career, of the beginning of being sick, and being effectively ruined financially. So – saying farewell Mississauga in itself is one in the win column. In the end, on that final day in Mississauga came the decision to actually move east rather than west. That decision was based on budget more than anything else, although I was looking forward to leaving the Toronto area with its 6+ million people behind me. 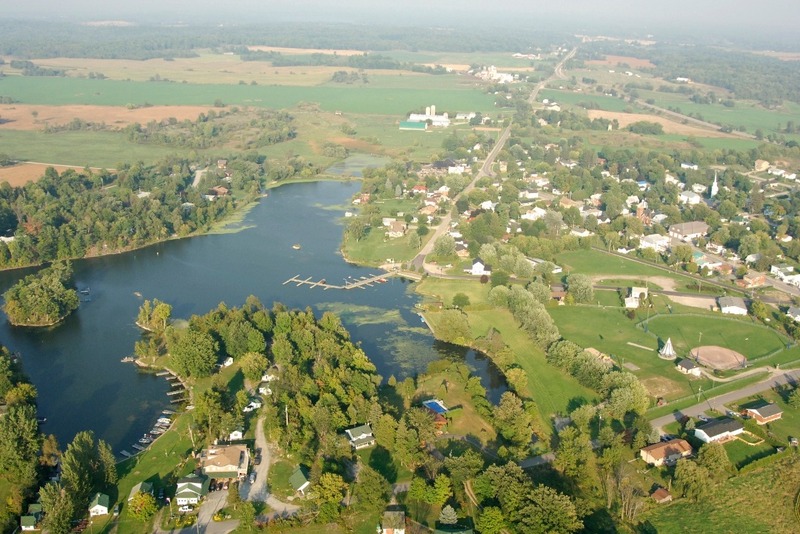 I landed in Seeley’s Bay (Population <500) in the Township of Leeds and the Thousand Islands. It is quite picturesque, and on the Rideau waterway leading from Ottawa to Kingston. I’m saying picturesque based on the picture above, because right now it has been snowing for days, and my best view is of the kids across the street’s kickass snow fort in the front yard. Living in a town with less than 500 people is a new experience, so too living in an old house, now converted to apartments. As I expected, everyone knows each other here (not in the house, but the whole town), and I have simply become “the man in Isabel’s apartment”. Isabel apparently passed away some time ago, although not “in” the apartment, which everyone is suspiciously too quick to add. I didn’t know that there were somewhat urban areas that didn’t have regular trash collection, or that don’t actually get mail delivered. On the plus side, they actually plough the roads repeatedly all day, although that is slightly less important when you don’t have a car. This change has been a good one, even though it was sheer hell getting to this point. I’m in a place that I can walk everywhere, everyone is friendly and helpful, and I’m sure that by summer I will have progressed from “the man in Isabel’s apartment” to Erik. I do not want to move ever again, but I tend to say that every time. Like I said, this one was tough, and the MS was probably responsible for most of problems. But that is water under the bridge, and I’m physically no different than I was last fall. Good days/bad days. I am learning that in an old house with not a flat, level floor to be found, that having an illness that affects your balance causes “the man in Isabel’s apartment” to keep falling over more than before. Small price to pay for the rent being 1/3 of Mississauga. I wanted to do this update today specifically (30-Jan-2019) as it is “Bell Let’s Talk” day, which promotes awareness of issues of mental health. The program is built on 4 key pillars: Fighting the stigma, improving access to care, supporting world-class research and leading by example in workplace mental health. Several years ago, prior to knowing about the MS, I was diagnosed with Major Depressive Disorder. I have probably had some form of the illness for most of my life, but never received a definitive diagnosis until then. It is controlled with medication, but the symptoms never really go away – the meds just dull down the worst aspects, they don’t just suddenly make Erik a happy boy. I’m sharing this today, for the first time (go big or go home) because people need to be able to talk about it. Getting help that requires more than a prescription remains unbelievably difficult regardless of where you live. The incredible gifts of kindness from everyone in the fall of 2018 literally made the “can’t do this anymore” state of mind become a “maybe I can”. The groundwork has been set. I have made my personal situation better by getting to a better place literally and figuratively. Reaching the financial target I set when I began this campaign will get me to self sufficiency. It has only been with your help that I was able to get to the “maybe I can” stage, and with your help the next goal is “turning things around successfully”. Thank you all so very much for your generosity and kind words. The goal is around the corner, and your help in the home stretch is appreciated. Thank you to everyone who has been in contact, your generosity is appreciated beyond what I can easily express here. Most of the donations thus far will take care of getting caught up with the rent and utilities, so that is a *huge* weight being lifted. Now it is a matter of being able to accomplish a move and start to build a solid enough foundation to get some kind of life back. Thank you so very much everyone. Thank you so much to those people who have been kind enough to donate. Sadly, this evening I was advised that I have 60 days to vacate, which certainly makes the situation even worse.